Caffi Sio – Cardiff’s newest culture café, opened last week with a launch event on Wednesday, the 14th of June. While we had heard a lot of buzz about this new spot at the Bay, the Cardiff Times team took it upon ourselves to investigate what Sio is really like. Any art fan in Cardiff is familiar with Craft in The Bay, the charming little exhibition and craft retail space. After browsing through the wonderful creations of Welsh artists, you can now step into a small space of light, bright yellow and good coffee. Caffi Sio, specialising in artisan brunch, lunch and coffee, is a two-floor café with a stylish modern minimalistic design. With three glass walls, and a thin skylight over the entire length of the space, dramatic shapes of light and shadow are cast throughout the interior. The café offers a spectacular almost postcard-like view over some of the most iconic buildings of the Bay. While currently there are only two outdoor tables available, Sio is working towards obtaining a license for tables aligned with the nearby fountain, where people seem to gravitate on a sunny summer day. The first thing you need to know about Caffi Sio is that it’s owned by the Chapter Arts Centre. The aim of the café is to allow money to enter back into the not-so-profitable art scene, as all revenues are to help support Chapter Arts projects and exhibitions. The idea came from the already existing Caffi Bar Chapter, which is one of the main income providers of the art centre. Caffi Bar also inspired the name Sio – Welsh for whiz and buzz, this name represents the hope to recreate the same busyness and energy seen in Chapter’s existing café bar. Sio will also provide opportunities for local artists by displaying a wall of artwork (to be changed every few months), and hosting live music events. The first artist to be featured will be Laura Sorvala (http://www.auralab.co.uk/), whose work will be produced in the café during opening hours, allowing visitors to witness the progress of the work during its making. As an artist myself, I think this is an amazing idea, as itwill raise awareness of the amount of time, effort and hard work involved in producing quality pieces – something which far too many people believe comes easily and naturally to those lucky enough to be ‘talented’. The only criticism I have is that the café provides merely a single wall for artwork, which significantly limits the number of art pieces to be displayed. Dedicating only one wall to art pieces works fine for larger venues, such as Little Man Coffee Co, but here the available wall space is quite scarce. Perhaps in the future platforms for sculptures could be positioned on the ground floor, or boards for hanging artwork could be suspended from the ceiling by the second-floor glass walls. Sio is advertised as “a new chapter”, and this is not merely a play on the art centre’s name. What differs from Caffi Bar Chapter, aside from the location, is the diverse artisan menu. Chapter’s first café may have won awards for its sensitivity towards different diet preferences, as one of PETA’s top five vegan-friendly cultural venues; however, the menu is fairly classic. There, you can find the traditional English breakfast, and a range of sandwiches and jacket potatoes, many of which with a veggie or gluten-free spin. I find this to be common among cafés and restaurants located in galleries, exhibition venues and bookshops – spaces filled with inspiring ideas often have less than inspired menus. Sio, on the other hand, is a lunch spot featuring exhibitions, rather than the opposite, and their menu would satisfy most foodies. During the launch event, we had the chance to sample some of the bite-sized treats on offer for conference hires of the venue. My favourite among them was the vegan carrot and quinoa fritter, which was light and packed with flavour. After looking through the menu, I am most excited to try the Aubergine Souvlaki – marinated aubergine skewers, served with edamame hummus, fresh salad and flatbread. Sio definitely continues the Chapter tradition of providing options for all diets. Each section of the menu (which are brunch, lunch, and quick lunch – for those with limited dining time) includes at least one vegan option, a few vegetarian ones and a range of gluten-free meals. 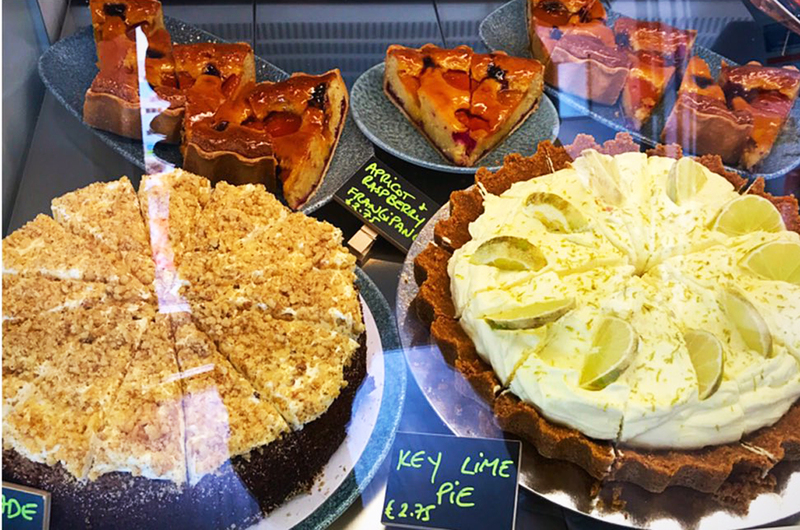 What surprised me most were the cakes by the counter – any vegan knows that it’s a pain to find even a single vegan cake slice in Cardiff without paying a visit to Milgi. In Sio, though, half of the cakes available were, in fact, vegan, and looked good enough to tempt just about anyone. If successful, Caffi Sio is also considering launching a pre-show menu, for those visiting the Welsh Millennium Centre. This would definitely be the perfect pre-show spot, with a great view towards the beautiful centre, and a variety of cultural experiences to set the mood for a night of theatre or music. Caffi Sio may be precisely what Cardiff’s wide rangeof coffee shops has been missing. It combines just about all reasons to preference a coffee shop – good atmosphere and interior design, great view and location, live music, exhibitions and artisan meals. I have complete faith that it will soon become one of the go-to lunch spots at the Bay. 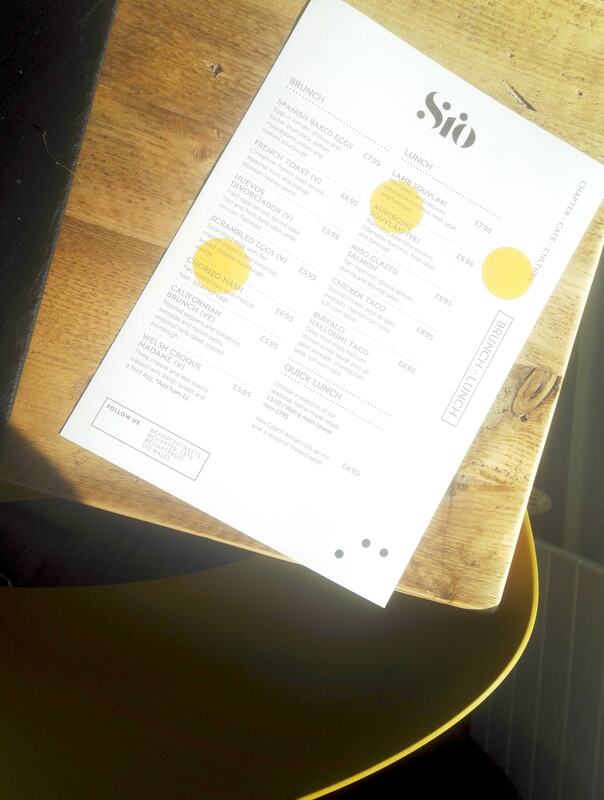 A few small adjustments, such as more artwork space and additional outdoors seating, will easily position Sio as one of Cardiff’s best places for brunching out. For more information on Caffi Sio, look out for a copy of the Cardiff Times July issue, where we’ve dedicated a double page spread to the new café.